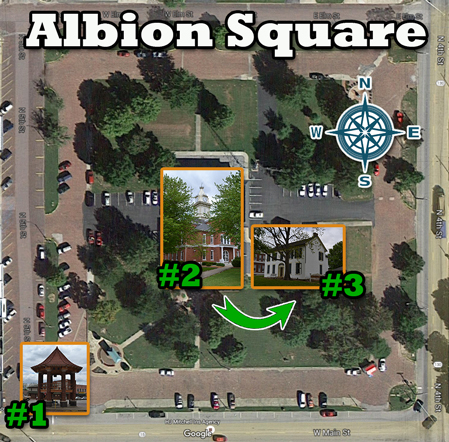 The Edwards County Courthouse is located in the public square in Albion. The main portion of the present Edwards County Courthouse was built in 1888 after somewhat of a public controversy. This is actually the third courthouse to be built here. 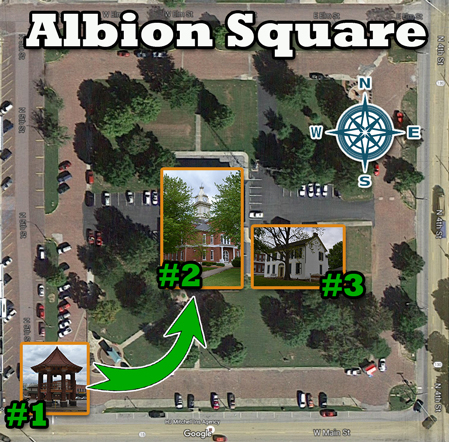 The first courthouse built in Albion was erected in 1825 on the southwest part of the public square at a cost of $3,000. The county seat had been moved to Albion from Palmyra in 1824. This first courthouse was a two‐story, brick structure with the courtroom and a debtor’s prison on the second floor. It served the people of Edwards County until 1852. The old 1825 courthouse was sold to General William Pickering who was given nine months to remove the old building. The bricks were cleaned and used to build a residence for Mr. Pickering at 239 North Sixth Street in Albion. That residence is still standing and is presently owned by the Edwards County Historical Society. In 1852, a contract was let to Elias Weaver for $3,600 for the purpose of constructing a new courthouse, the second one to be built in Albion. Elias Weaver was a Rappite who had moved to the English Settlement from Harmonie, Posey County, Indiana. Weaver was the builder of many early brick buildings in the area, including the Old Edwards County Jail just east of the present courthouse. In 1887 an attempt to build a new courthouse failed. Early in 1887, a grand jury had been called to consider the condition of the 1852 courthouse. On April 14th, 1887, the report of the grand jury was issued condemning the courthouse. After much wrangling, and a threat to move the county seat to Browns, it was agreed that the 1852 courthouse would be “remodeled”. The building could be “remodeled”, but not replaced, by the County Commissioners without the approval of the voters. On June 7th, 1887, “repairs” to the courthouse were ordered. McDonald Brothers, architects of Louisville, Kentucky, submitted plans for the “repair” work. The contract was let to Joseph Harris and Sons for $8,345. 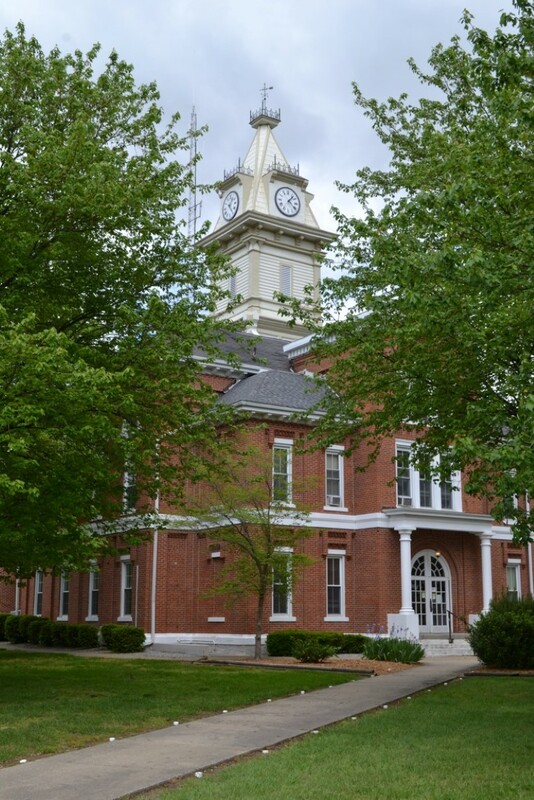 In July and August of 1887, the County was put to the expense of defending itself in injunction suits filed in White and Wabash Counties in an attempt to stop work on the courthouse. The town clock arrived about this same time. On December 1st, 1887, the Town Board of Albion had appointed a committee to purchase a clock for the tower of the soon‐to‐be “remodeled” courthouse. It was no easy task hoisting it in the tower of the courthouse on March 29th, 1888. The clock weighs 1,500 pounds, the weights weigh 1,000 pounds, the bell weighs 590 pounds for a combined total of about 3,090 pounds – or a little over one and one‐half tons! In July, 1888, the Albion Journal reported that the “court‐house is now practically completed and it is probable that a special meeting of the Board will be held next Tuesday to receive the building.” The Journal went on to praise the quality of the work and stated that it was very largely a “home product”. The bricks were made locally by Mr. Bassett, the foundation is of stone quarried locally. The brick work, stone setting, and plastering were done mostly by local workmen supervised by W. T. Burrell, a local man. The interior woodwork was done by local labor. The tin and sheet‐iron work was done by George Weave, another local artisan. By late July, 1888 the county officers had moved into their new offices in the courthouse. New furniture had been ordered for those offices and for the courtroom for a total of $550. In July, 1911, the courthouse was wired for electricity. In 1940, an appropriation was approved by the Works Progress Administration, or WPA, for a $32,000 addition to the courthouse. The WPA was to furnish $19,551 and the county about $12,000. This was the east addition of the present courthouse. In 1997, an addition was built onto the north side of the present courthouse. This addition houses the courtroom, the sheriff’s department and the supervisor of assessments office. fretwork sits atop each clock face and atop the copper‐clad square platform which crowns the tower.